When the Third Fleet calls on the Moonlighter for help, Stella is granted the very thing she has dreamt of since she was 8 years old. Her first Intervention. Descending from the heavens to rescue the women of an alien planet and gifting them a new life of peace and prosperity as members of PULSE. But her dream quickly turns into a nightmare, as the jungle-planet of Sattica proves to be more resistant than anyone could have planned for. 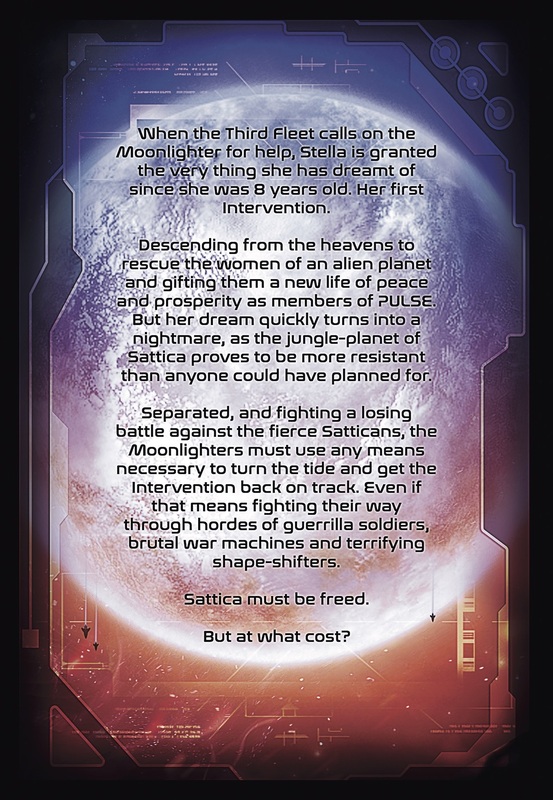 Separated, and fighting a losing battle against the fierce Satticans, the Moonlighters must use any means necessary to turn the tide and get the Intervention back on track. Even if that means fighting their way through hordes of guerrilla soldiers, brutal war machines and terrifying shape-shifters.